Attach this 1" RAM Ball Mount to your Camera, then let the action begin! Click Here to build your own rock solid mounting solution from surface to camera. See also our Tallon RAM Custom GoPro Hero Mounting Kits - pro mounting solutions for vehicles, boats, jet skis, snow mobiles, ATVs, side by sides, helicopters, gliders, etc. Tallon Mini Sockets & RAM Mount Bases can be installed just about anywhere and accept a wide range of accessories such as tablet & phone holders and drink holders! 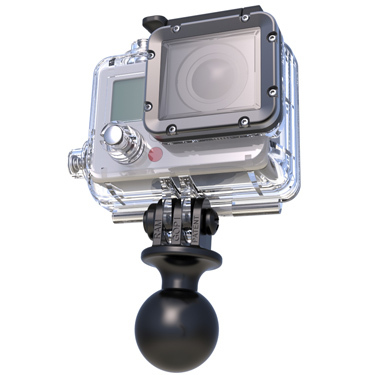 GoPro 1" Ball Adapter with hardware supplied.